Wednesday 2 July will be 12 months since the Haneef case first brought the issues of anti-terror laws to the public eye in Queensland. On this day, Amnesty International Australia - Queensland and Northern NSW Region will host a forum to explore what has changed in the last 12 months and if there is potential for change with the new federal government. 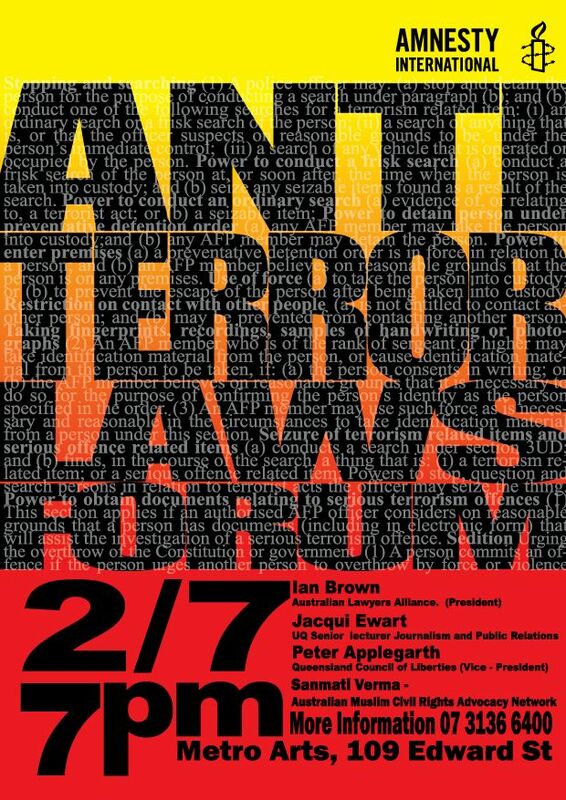 Speakers include Ian Brown, Australian Lawyers Alliance; Jacqui Ewart, Lecturer, Peter Applegarth, Qld Council of Liberties; and Sanmati Verma, AMCRAN.